**EDIT** WE HAVE A WINNER** Get a Copy Of Manborg on DVD FOR FREE!!! Okay folks, we have a WINNER!!! Congrats to Scott T. of Calgary, Alberta, Canada for being the one that is first to respond. 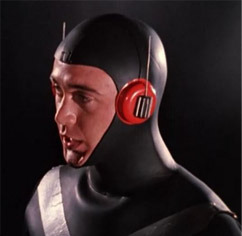 You sir, will have yourself a copy of Manborg. Do You Have a Blog or Site Dedicated to Bad or Weird Movies? Lets Swap Links! How would you like to share links? I am having a lot of fun with this blog, and hope you are enjoying it too. If you have a blog or site that is dedicated to B-Movies, or weird movies…or unusual movies or what ever, I’d love to see it. Heck I might even want to feature it here… AND I would love to link to your site while having you link to mine. What do you say? We lovers of the strange need to stick together. Ok… Well I liked this film more than I expected! 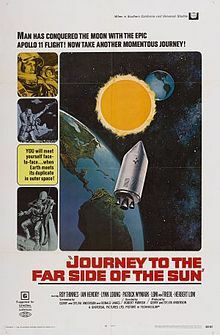 Journey to the Far Side of the Sun (also known as Doppelgänger) is a 1969 British Science Fiction film about an expedition to a new planet discovered in the same orbit as Earth, but exactly opposite the Sun as out Planet. A planet55 that turns out to be the exact mirror of our own – right down to the events, languages and people. A weird and highly improbable situation – none the less, I found the movie compelling. Average acting, but surprisingly good sets and special effects (compared to many other films high lited on this site, at least), this one is a little like a diamond in the rough. Travelling through the Solar System in 2069, the unmanned Sun Probe locates a planet that lies on the same orbital path as Earth but is positioned on the opposite side of the Sun. Dr Kurt Hassler (Herbert Lom) of EUROSEC (EUROpean Space Exploration Council) has been transmitting Sun Probe flight data to a rival power in the East, but Security Chief Mark Neuman (George Sewell) uncovers the betrayal and shoots Hassler dead in his laboratory. EUROSEC director Jason Webb (Patrick Wymark) convinces NASA representative David Poulson (Ed Bishop) that the West must launch astronauts to investigate the planet before Hassler’s allies in the East. With EUROSEC member states France and Germany unwilling to offer financial support, Webb obtains majority funding from NASA. American astronaut Colonel Glenn Ross (Roy Thinnes) and British astrophysicist Dr John Kane (Ian Hendry), head of theSun Probe project, are assigned to the mission. Launched from the EUROSEC Space Centre in Portugal in the Phoenix spacecraft, Ross and Kane pass the first half of their six-week round trip in stasis, with “Heart Lung Kidney” machines managing their life functions. Three weeks after launch, the astronauts are revived in the orbit of the planet. Scans for the existence of extraterrestrial life prove to be inconclusive, and Ross and Kane decide to make a surface landing. While the astronauts descend through the atmosphere, an electrical storm damages their Dove lander shuttle, which crashes in a mountainous region that is revealed to be Ulan Bator, Mongolia. When an air-sea rescue unit returns Ross and Kane, the latter fighting serious injuries, to the Space Centre in Portugal, it is apparent that the Phoenix mission has been terminated after three weeks and that the astronauts have arrived back on Earth. Neuman and EUROSEC official Lise Hartman (Loni von Friedl) interrogate Ross, who denies that he aborted the mission. Shortly after, Kane dies from the injuries that he sustained in the crash. Eventually, Ross assembles a series of clues that point him to the conclusion that he is not on Earth, but indeed on the unknown planet — a Counter-Earth that is a mirror image of his. Many, including his wife, Sharon (Lynn Loring), are baffled by his claims that all aspects of life on the planet — from the print in books to the plan of his apartment — are reversed. However, Webb is convinced of the truth when Ross demonstrates the ability to read aloud from a sign, without hesitation, when it is reflected in a mirror. Later, X-rays from Kane’s post-mortem examination reveal that his internal organs are located on the wrong side of his body. Ross conjectures that the two Earths lie parallel, which would mean that the Ross from the Counter-Earth is living through similar experiences on the far side of the Sun. Webb suggests that Ross recover the flight recorder from Phoenix, and then return to his Earth. EUROSEC constructs a replacement for Dove that is designed to be compatible with the reversed technologies of Phoenix. Modifications include the reverse-polarisation of electric circuits, although neither Ross nor the scientists can be certain that the differences between the two Earths extend to the direction of electric current. The shuttle is re-christenedDoppelganger, a term denoting a duplicate of a person or object in the original German. Lifting off and entering orbit, Ross attempts to dock with Phoenix. However, Doppelgangerexperiences a technical malfunction, indicating that current is constant after all. 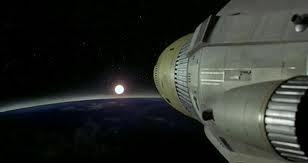 The shuttle detaches from Phoenix and loses contact with EUROSEC, falling through the atmosphere towards the Space Centre with Ross struggling to disengage automatic landing control. EUROSEC is unable to repair the fault from the ground, and Doppelganger crashes into a parked spacecraft. Ross is incinerated in the collision and a chain reaction obliterates the Space Centre, killing personnel and destroying all records of Ross’s presence on the Counter-Earth. Decades later, a bitter Jason Webb, long since dismissed from EUROSEC, has been admitted to a nursing home. In his dementia, the old man spies his reflection in a mirror mounted on a window. Rolling forwards in his wheelchair, and reaching out to touch his image, Webb dies when he crashes through the mirror. Whew! that’s a lot, and sorry for taking the easy way out by posting that but it is way better than I could hope. I like this movie, and say watch it, if you get a chance. Mars needs women – they have a Y chromosome deficiency on the planet making the deficit of women to men at a 100 to 1 level (like any lan party or comic convention), and they’ve come to Earth to replenish their supply of babes. A quirky, super low budget film that was made for television, this is kind of fun. Good? Oh, Hell no – but fun. A lot of actors in this are also found in Curse of the Swamp Creature and Zontar – The Thing From Venus (both reviewed on this blog), as I believe they share writers/directors. I guess there was a stable of actors for use in these crappy films.. I doubt that the film made much of a splash at the time, as it is hard to find a copy of it now. I did find a copy on Youtube (that I watched to write this), but most links reference the Rob Zombie song of the same name. The premise is that a military decoding station has intercepted a message, only three words, “Mars Needs Women”. 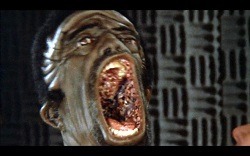 As the plot unfolds it’s revealed that Martians have a genetic deficiency that produces only male babies. 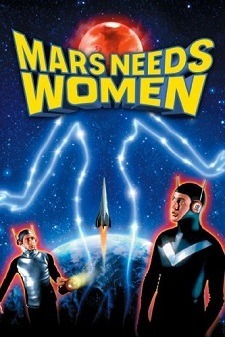 They launch a mission to Earth consisting of five Martians who recruit volunteer women to come to Mars. They meet strong resistance on the part of the Earth authorities. Oh, and a Martian falls in love with a hot female DNA expert. Should you watch it? Oh, probably not, but if you decide that you want to check it out on youtube. Here’s the basic idea: A man discovers a white goo like substance bubbling from the ground, weirdly decides to taste it, and it turns out to be sweet and delicious. 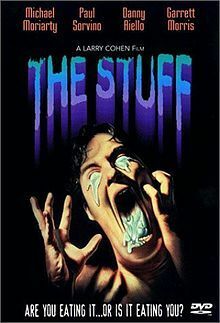 Soon the product was being mass marketed as “The Stuff” and takes America by storm. Marketed in a tub like Ice Cream, but with what seems like the consistency of a cross between marshmallow paste and shaving cream, people start eating it as a desert but quickly it becomes the only meal it’s fans eat. Slick commercials sells the products to the masses selling it’s flavour and the fact that it has zero calories – a practically miracle food it would seem. Well, have you heard the saying that if something seems too good to be true, it probably is too good to be true. Well, the Stuff becomes so popular that it starts killing the Ice Cream industry. Dairy officials hire former F.B.I. agent turned industrial saboteur, David “Mo Rutherford (played by Michael Moriarty) and Junk Food King, Charles W. “Chocolate Chip Charlie” Hobbs (played by the always great Garrett Morris), to find out what’s actually in The Stuff, and help destroy it. The more he looks into just what The Stuff is, the more he realizes just how diabolical and dangerous The Stuff actually is. Teaming up with an Advertising guru that helped popularize The Stuff, a kid who discovered early how dangerous the Stuff is when it took over his family and a Militia leader (played by Paul Sorvino), the take on the manufacturer, distributer and The Stuff itself. A definitely silly film that takes a poke at mass marketing and how the public easily falls prey to it, I have to recommend this film – it has a charm that is so rare in film. Sure it’s weird – so am I and people like me (well, they say they do). Watch this film. Go out and buy the DVD, or watch it on Netflix (that’s what I did)… Or even watch it for free on Youtube (I didn’t know it was available there until about 30 seconds before writing this sentence). – Just watch it.